This event will be moderated by CSSD project director Jack Halberstam in conversation with Manu Karuka, Audra Simpson, Sandy Grande, and Karl Jacoby. Additional support provided by the Institute for Research on Women, Gender, and Sexuality (IRWGS) at Columbia University; and the American Studies Program at Barnard College. Co-sponsored by the Racial Capitalism Working Group, the Center for the Study of Social Difference, Columbia University, Barnard’s New Directions in American Studies, Verso Books, and The People’s Forum. 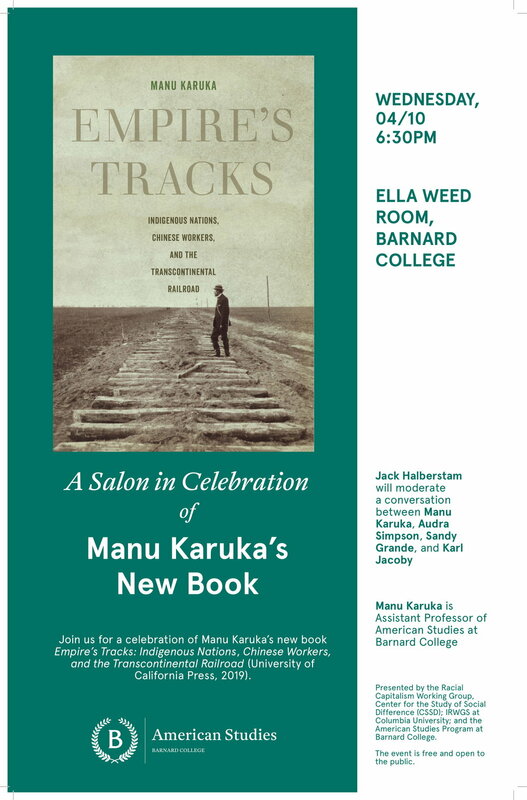 CSSD working group Racial Capitalism co-sponsors the launch of Manu Karuka’s new book. Empire’s Tracks: Indigenous Nations, Chinese Workers, and the Transcontinental Railroad (University of California Press, 2019). Karuka’s book boldly reframes the history of the transcontinental railroad from the perspectives of the Cheyenne, Lakota, and Pawnee Native American tribes, and the Chinese migrants who toiled on its path. In this meticulously researched book, Manu Karuka situates the railroad within the violent global histories of colonialism and capitalism. Through an examination of legislative, military, and business records, Karuka deftly explains the imperial foundations of U.S. political economy. Tracing the shared paths of Indigenous and Asian American histories, this multisited interdisciplinary study connects military occupation to exclusionary border policies, a linked chain spanning the heart of U.S. imperialism. This highly original and beautifully wrought book unveils how the transcontinental railroad laid the tracks of the U.S. Empire. 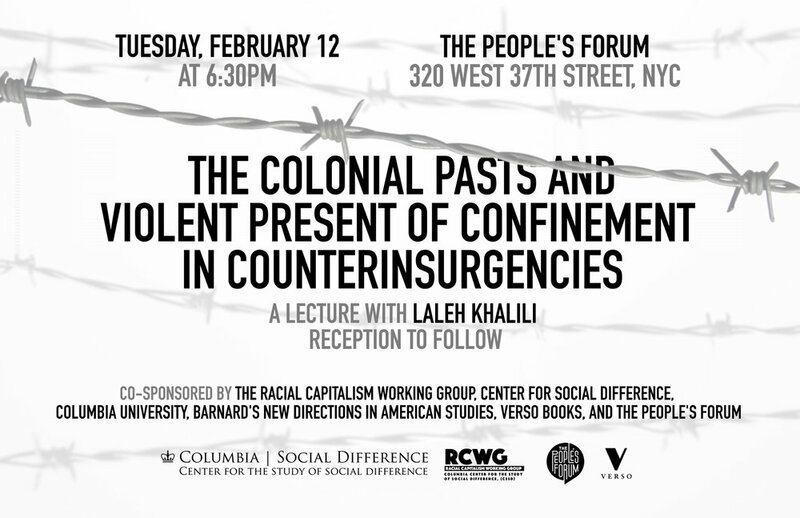 CSSD working group Racial Capitalism co-sponsors Colonial Pasts and Violent Present of Confinement in Counterinsurgencies with Laleh Khalili, Professor of Middle East Politics SOAS University of London, on the evolution of modern regimes. Detention and confinement— both of combatants and large groups of civilians—have become fixtures of asymmetric wars over the course of the last century, with a huge increase in the employment of detention camps, internment centres, and the enclosure or isolation of groups of people. Khalili examines the practices and historical roots of two major liberal counterinsurgencies of our day – the Israeli occupation of Palestine and the U.S. War on Terror. She argues that although practices of incarceration have been defended by the assertion that they constitute measures to “protect” populations against violence and terrorism, liberal states have in fact consistently acted illiberally in their confinements, and that this has increasingly encouraged policymakers willingly to choose to wage wars. There will be a reception after the talk. Additional co-sponsorship by the Center for Social Difference, Columbia University, Barnard’s New Directions in American Studies, Verso Books, and the People’s Forum. This one-day conference recovers the histories and possible futures of anti-imperialist struggle.